This tells you that more than 5 million pages in the Google index match the search terms. Actually, most of these pages don’t match well. Most of the pages don’t actually have the term fosamax. Rather, they have the words fosamax and attorney scattered around the page. It’s common for journalists to use this method to make some point or other — to prove the popularity of a particular subject, for instance — without realizing that it makes no sense. Search for your terms by using quotation marks. Type search terms in quotation marks, like this: “fosamax attorney.” This time, Google searches for the exact phrase and comes back with a different number. It came back with 221,000 because Google ignores all the pages with the words scattered around the page, and returns only pages with the exact phrase. Here’s the problem with these two techniques: Although they show you how commonly used the words are, they don’t show you how well the pages are optimized. Remember, you’re not competing against every page with these terms; you’re really competing with pages that were optimized for search engines. There may be millions of pages with the term, but if none of them have been optimized, you can take your newfound SEO knowledge, create your own optimized pages, and have a good chance of ranking well. 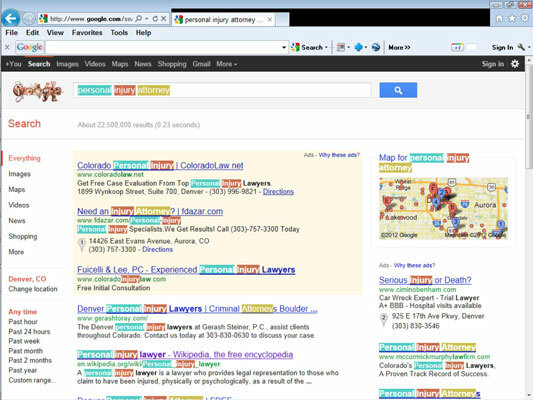 PPC ads on the page: For instance, you see search results for the phrase personal injury attorney. As you look down the page, you see three PPC ads at the top of the page and then more ads all the way down the right side of the page. Lots of PPC ads indicate lots of interest in the phrase. If people are spending money on PPC ads, many are also probably spending money on SEO. Lots of local results: Google, Yahoo!, and Bing interpret some searches as local results; in such cases the search engines try to figure out where you are and then display information about businesses in your local area. The phrase personal injury attorney is definitely one that all three major search engines regard as local. Bold and highlighted words on the page: You also notice that Google bolds the words that you searched for (and, if you’re using the Highlight button on the Google toolbar and search using the search box on the toolbar to search Google, the words are also colored). All the major search sites do this. Lots of bold words often mean well-optimized pages. Bold words in the links (page titles): Bold words in each page result’s link indicate that someone has been optimizing the pages. The links are the page titles, so the more bold text you see as you scan down, the more often site owners have been placing the keywords into the <TITLE> tags and the more competitive the search terms are likely to be. Complete phrases on the page: The more frequently you see the full phrase you searched for, the more competitive the terms are likely to be. If the search engine returns mostly pages with the words scattered around, it’s not very competitive. Here’s another example. Search Google for rodent engineering. What do you see? Something similar to the following figure. First, notice the absence of PPC ads; apparently, nobody’s willing to pay to rank high for this term! 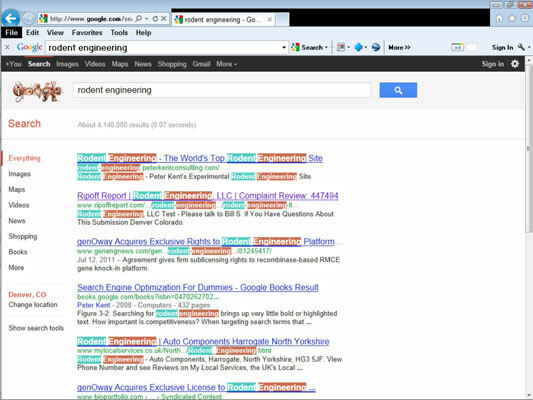 Next, notice relatively little bold or highlighted text on the page, and just one of the page titles (the links at the top of each search result) contains the full phrase rodent engineering. You can see the difference between these two pages. The first search term, personal injury attorney, is far more competitive than the second, rodent engineering. How important is competitiveness? When targeting search terms that aren’t very competitive, you may be able to create a few optimized pages and rank well. In very competitive areas, though, creating a few nicely optimized pages isn’t enough. You must have links pointing to the site (perhaps many of them), and you may also need large numbers of pages. In some really competitive areas, it may take hundreds, if not thousands, of links.